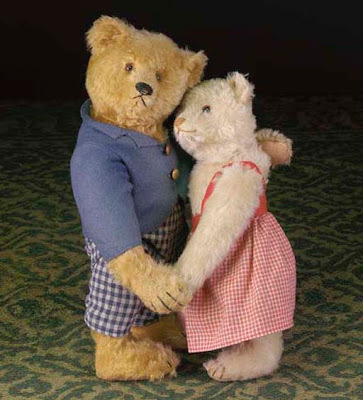 These two bears are similar to those that were featured dancing in a display made by Steiff in 1925. At one stage they were on display in San Francisco for the American Children's Day on June 18, 1927. Called 'The Bears' Wedding', at least six bear couples were dancing on a raised area in the middle of a village, as a wedding procession comes out of the church. It is possible that this type of bear was made for other displays. This pair sold for £13,200 at Christie's Teddy Bear sale on 13th December 2005. A similar pair of bears were sold at Christie's on the 13th February 1992. These now reside in the Puppenhausmuseum in Basel and are photographed on page 50 of their museum catalogue. A pair of dancing bears and three musicians were also sold at the Steiff 2003 Festival in Giengen, lot 50. You can also buy a Steiff Limited Edition of this type of bears, I think they are charming..